Is Coronado a real island? Well, yes, sort of. Technically it's a peninsula since its connected by a sliver of land called the Silver Strand. In the early days before development the Silver Strand was more of a sandbar which would flood during high tide, making Coronado an actual island - if only for a few hours. So it was an island, sort of, at one time. Since its inception, Coronado has been a special place in San Diego though its original owners who sold it for $1,000 in 1846 might have had a few regrets when just 39 years later it was sold to developers for $110,000 who dreamed of turning this barren land into a resort destination with the Hotel Del Coronado as its centerpiece. Today's it remains a special place, a destination that's the perfect backdrop for your San Diego vacation. Ask any local what the best ocean front beach resort is in San Diego and their answer invariably will be "The Del". 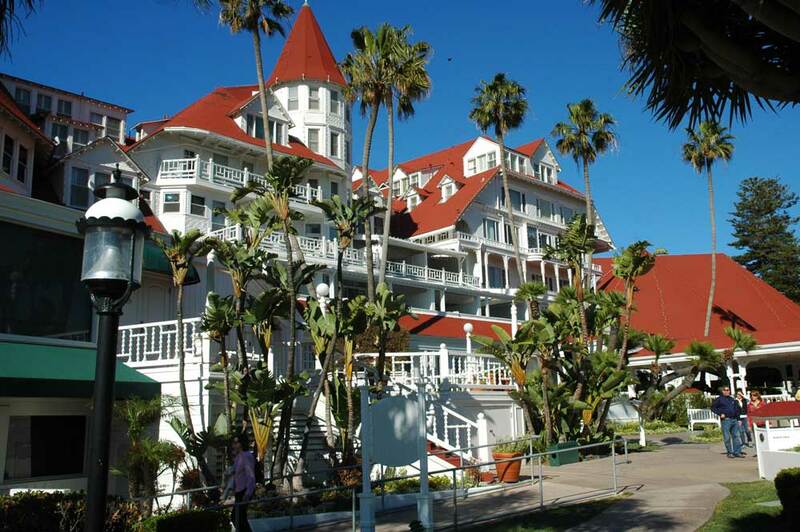 Built in 1888, it stands today as one of the most beautiful beach resorts in America. The Del has earned its reputation as "one of the top ten resorts in the world" by USA Today but more importantly, Local Wally's pick for Top San Diego Beach Resort. From the moment you pull up to the valet you know you've arrived. Red carpet, white gloves, this is old school elegance. Inside, the darkened room hosts the original lobby and the original birdcage elevator with an actual human being pushing the buttons for you. But don't worry that the rooms are ready for Grandma and done up with doily's and Hummels. Room decor varies depending on whether you stay in the more modern towers or the original historic hotel, but all of it is tasteful and classic, and room size also varies from teeny tiny "is this the closet?" to large ocean view suites to private beach cottages with views range from a full parking lot to full ocean view. You get what you pay for, so pony up the big bucks if you want the ocean view experience - and if your budget only affords you a dinky room, so what? You're still at The Del, quit complaining. There's a reason why the Hotel Del Coronado has remained San Diego's top resort from the day it opened nearly a hundred and thirty years ago. The magnificent resort continues to delight visitors to this day and is the backdrop for the quintessential San Diego beach vacation. And don't miss the famous Sunday Brunch, an extravagant affair at $90 per person but winner of many "best of San Diego" awards. Bring me a doggie bag. PRO'S: Right on the beach, an old school resort destination that will make lifetime memories. CON'S: Can get super busy during the summer with lookie-loo's, super expensive at high season. WALLY SAYS: Wow, it's like my life went from black and white to color! 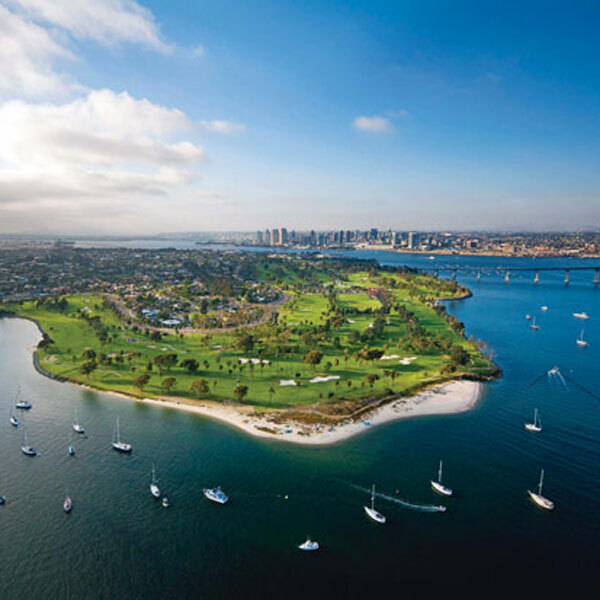 With sweeping views of the San Diego bay and skyline, the Marriott Coronado Island Resort boasts one of the better views of any bayside hotel. Its location away from the crowds is perfect for the anyone who wants to see the sights during the day but come back to a quiet resort at night. The front looks so businesslike you might freak out that you didn't bring your laptop but step around to the back and the tropical landscaping kicks in. 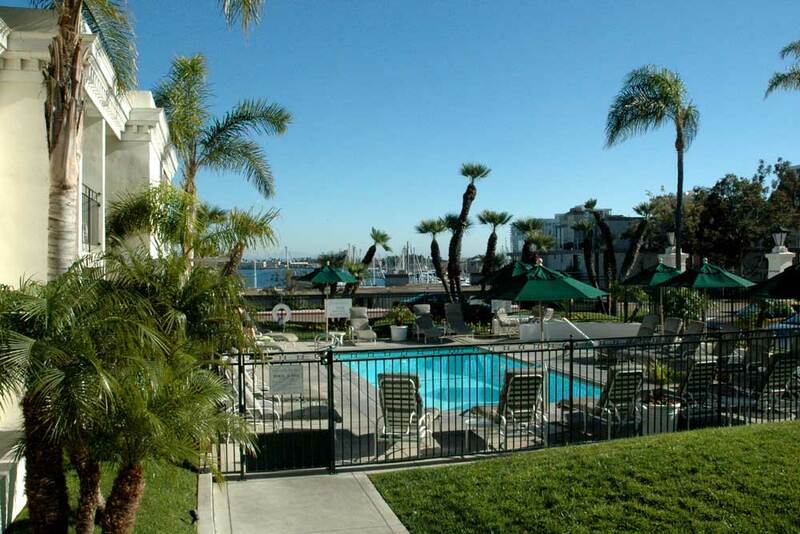 There are three heated pools and tennis courts to keep you busy and when it's time for dinner or some sightseeing their water taxi service will zip you across the bay to the restaurants and Gaslamp District. Rooms are standard Marriott, meaning you won't gush when you first arrive but will appreciate the quality and comfort once you settle in. Now the downside - the bayside location means there is no beach access, so if you were hoping to jump out of bed and into the ocean this is not the place. And the hotel design can appear a bit generic, sort of like you've been here before at your last executive "sales summit" meeting. This isn't a swinging place like the trendy hotels in downtown nor a tropical paradise like the resorts on Mission Bay. But it's a solid pick for a family vacation or business trip if you want an above average hotel with resort amenities with great views and a great location. PRO'S: Great location, close to everything but away from the crowds. CON'S: Feels like I'm here on business. WALLY SAYS: Great pick for a hotel in a nice, quiet location. Plus I love taking the ferry to San Diego! Loews Coronado Bay Resort is a luxury property on the very southern side of Coronado, away from the busy town and tourists. It's on the bay side facing San Diego along that tiny sliver of land called the Silver Strand. With the marina outside and the beach down the road, it's a great location for those wanting a more secluded and less touristy vacation. The rooms have an island feel to them and a nice understated elegance to them with the expected amenities. The resort itself is a four star and has five restaurants, a full spa, its own marina, and even gondola rides. Yeah, it sort of feels like a tourist trap activity but I won't tell if you don't. The main pool pampers its guests with cabana service and cocktails and there's a shuttle to the nearby beach where you'll find beach chairs, towels and boogie boards. Because Loews Coronado is off the beaten path the beach is typically nice and private, a stark contrast to the beach blanket subdivisions you often find at the more well known beaches. PRO'S: Far away from the maddening crowds. CON'S: Far away from the attractions - you'll need a car for sure if you want to go anywhere. WALLY SAYS: You'll feel like you're on your own island when you stay at Loews Coronado!. 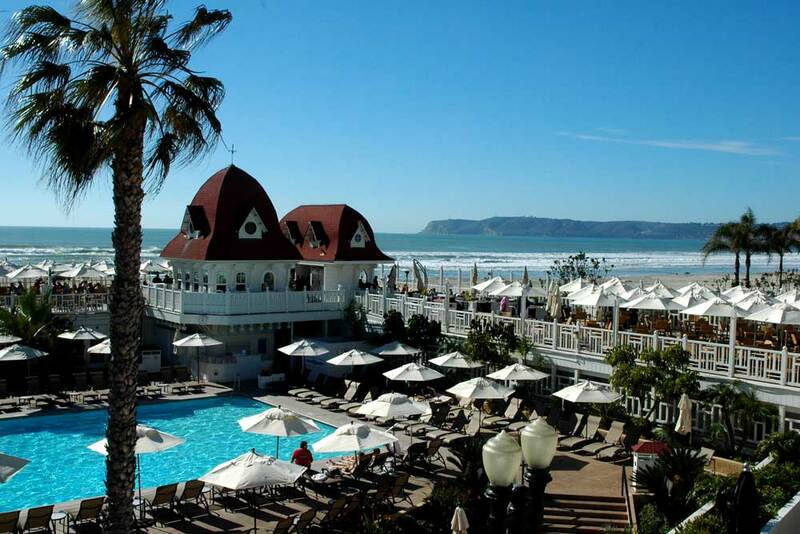 Located right across from the Hotel del Coronado, you can't beat this location. Restaurants up and down the street, the beach within walking distance, this is prime time Coronado. Step outside your door and you'll forget you're staying at a modest hotel. Walk across the street and Do the Del, hang out on their sundeck, order a cocktail and people watch at their bar, partake in the beach behind the resort (don't worry, it's public) , then come back at the end of the day to crash with a lot more cash left in your wallet. Not bad, not bad at all. To set your expectations right, this isn't the Del. It's not fancy, it's not trendy, it's cute in the way a Mexican hotel is. You're not going to get that spa bathroom, and there are no contemporary linens or decor. But it delivers where it counts with a clean room or suite, a bit of old world charm, laundry room, and a killer location. Right outside the hotel is Miguel's Cocina, a decent enough Mexican restaurant with great fish tacos and a lively vacation bar scene. 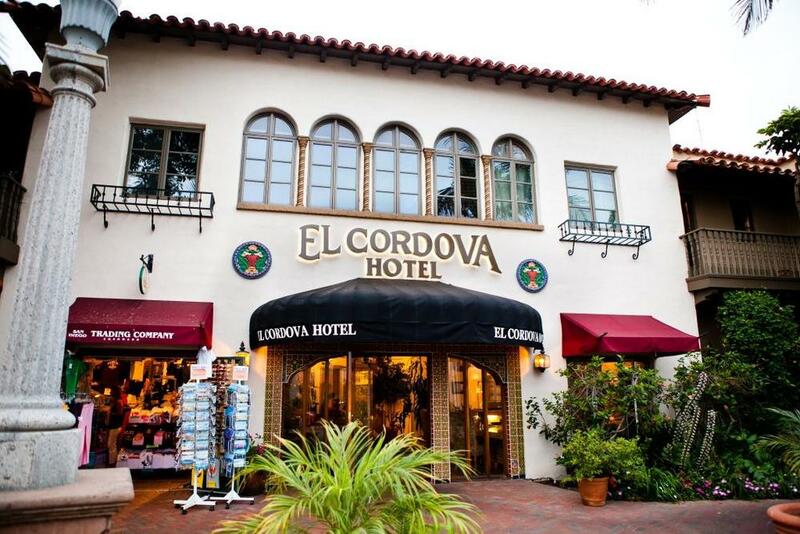 If you have your heart set on a Coronado vacation but your wallet is saying Mission Valley, book El Cordova and have it all. PRO'S: Super charming boutique hotel in the center of the action in Coronado. CON'S: Can get noisy since the courtyard has both the pool and restaurant. WALLY SAYS: It feels like a vacation in Mexico in all the best ways! If you want to stay someplace different why not stay at a mansion? John D. Spreckels' mansion, to be accurate. Yes, the guy who helped build Coronado and who was a visionary to San Diego's early development, You'll see his name everywhere around town, from the Spreckels Organ Pavilion in Balboa Park to Spreckels Theater and at the time was the richest man in town. He must be rolling in his grave knowing that those kids with mullets staying in his house belong to you! But stay in his mansion you can now that it has been modified and turned into the Glorietta Bay Inn, a posh hotel with traditional decorations and located across the street from the Hotel Del Coronado. Stay in the actual mansion for the full effect. It's a bit like staying in your rich aunt's house, all the way down to the milk and cookies at nighttime. The newer wings have less personality but are perfect for families looking for a hotel with a room or suite (some have full kitchens) at a price the belies its location. PRO'S: Quite impressive pulling up to your mansion. CON'S: A bit like staying at Grandma's house. WALLY SAYS: It's the exact opposite of the newer trendier hotels across the bay. I like it!